CD Genomics has been providing the accurate and affordable genotyping by sequencing service for couple of years. We employ the latest Illumina sequencing platforms to obtain genetic variations information in a more efficient way. 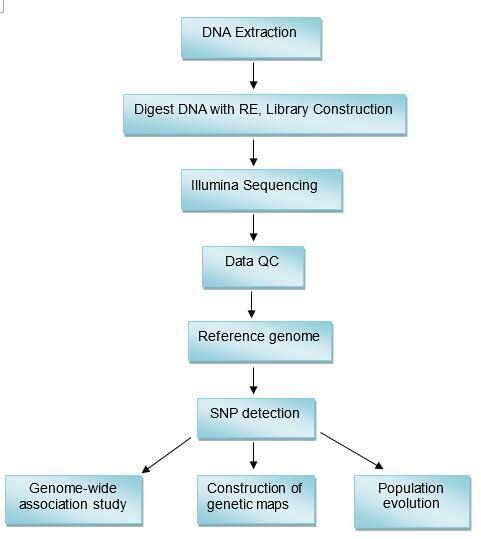 Genotyping by Sequencing (GBS), which belongs to one of Reduced-Representation Genome Sequencing techniques, is a method to discover single nucleotide polymorphisms (SNP) in order to perform genotyping studies. GBS greatly reduces genome complexity by using restriction enzymes to cleave the DNA coupled with DNA-barcoded adapters. By choosing appropriate restriction enzymes, GBS can provide high SNP coverage in gene-rich regions of the genome in a highly cost-effective manner, and in the assay to increase the number of tags. The sequenced portion of the genome is highly consistent within a population because restriction sites are generally conserved across species. This makes the GBS protocol highly suited for experiments that require surveying. Consequently, GBS is simple, quick, specific, highly reproducible, and rapid due to the simultaneous detection of SNPs and genotypes, and may reach important regions of the genome that are inaccessible to capture sequencing approaches. Thus, the key components of this system have a lower cost, reduced sample handling, fewer PCR and purification steps, no size fractionation, no reference sequence limits, and efficient barcoding, and the system is easy to scale up. These features make GBS a powerful tool for implementing genome-wide association study (GWAS), genomic diversity study, genetic linkage analysis, molecular marker discovery and genomic selection under a large scale of plant breeding programs. CD Genomics is proud to provide genotyping by sequencing service to advance your population based genotyping studies in an effective and economic way. Please contact us for more information and a detailed quote.